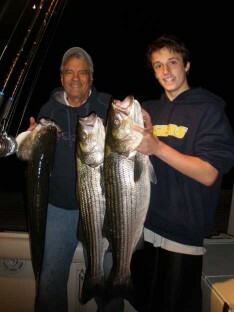 Free Fishing Reports > Northeast > New York > North Shore > Gino and Ron Get Evening Bite! The other evening, Ron and Gino were treated to some bunker snagging and later, a nice chunking bite! The duo had nice Bass in a short period of time, plus a few swings and misses! Mom and Grandma were happy to hear they got home safe!